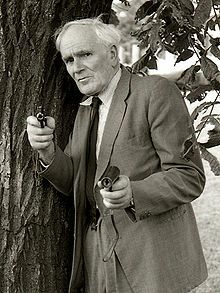 Desmond Wilkinson Llewelyn (12 September 1914 – 19 December 1999) was a Welsh movie, television, stage, radio and voice actor. He was best known for his role as Q in 17 of the James Bond movies from 1963 through 1999. Llewelyn was born on 12 September 1914 in Newport, Monmouthshire. He studied at Radley College. Llewelyn was married to Pamela Mary Pantlin from 1938 until his death in 1999. He died on 19 December 1999 in Firle, East Sussex, England due to being injured in a road accident. He was 85. ↑ "Desmond Llewelyn Biography (1914-1999)". Filmreference.com. Retrieved 19 November 2010. ↑ "Road death of Q actor accidental". London, United Kingdom: Guardian News and Media Limited. 14 June 2000. Retrieved 12 August 2012. Wikimedia Commons has media related to Desmond Llewelyn. This page was last changed on 28 August 2018, at 15:22.